End to the Flats and Handwashing Challenge: Let's Tally Up Our Savings! What we used costs $42.09 brand new (and can be purchased from Diaper Junction using the link to the right). A box of approximately 100 Huggies cost around $30 and will last about 2 weeks. For less than the price of one month of disposables, you could successfully cloth diaper your baby from birth to potty learning. I want to say a special "thank you" to Kim for organizing this challenge and opening my eyes to the savings our family has been missing out on. After today, I plan to continue to hand wash Bug's diapers, but will machine wash once a week to ensure a thorough cleaning. Be sure to watch Kim's blog, Dirty Diaper Laundry, to catch feedback she collected from everyone who took the challenge! Day 7: What Did We Really Use This Week? A few days before the Flats and Handwashing Challenge started, I made a post about what we'll be using during the challenge, and I wanted to give you all an update. We used the 12 flats in rotation, alternated between the Snappi, pins and just pad-folding, but we only used 2 covers! If a family were able to purchase a down flats, a set of pins and 2 one-size covers, they could easily diaper their baby for very little cost. I also experimented with washing with baking soda after reading a thread on DiaperSwappers.com with (to my surprise) much success. This routine worked great, and baking soda and vinegar are very cheap. Day 6: Really? It's been 6 days? This week has gone so fast. With one day left to the Flats and Handwashing challenge, I honestly can't believe I've been handwashing Buggie's diapers for almost a whole week already! What else happened this week? Bug got his first tooth and started scooting, pushing himself up to 3 feet in a single direction with his feet! We also started some new foods which has made washing his poopy flats, well, interesting to day the least. My other amazing news? So far this week, by handwashing instead of washing at the laundromat every day I have saved almost $15 already! Day 5: Alterations to "The Plan"
"@thegnomesmom tweeted about reusing her baby’s bath water to rinse her diapers!" 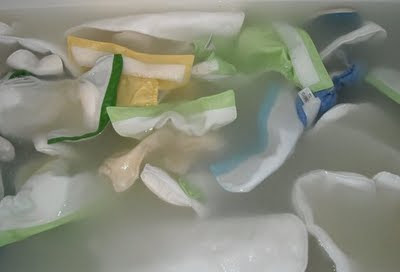 - I started using bath water to rinse out the dirty diapers after I soaked them in the bucket. We don't pay for our water, but that's still no reason to waste it! "Use skirt hangers. Use clothespins on a hanger." - We don't have skirt hangers, but I started folding the flats in half over empty hangers instead of layering them over the shower curtain rod. "The Eco Chic says maybe try vinegar in your rinse cycle." That was my response when I was asked what I was thinking when I explained the Flats and Handwashing Challenge to my family and told them I agreed to it lol Last night we took our first trip out of the house with flats. It was just as easy as any other diaper, but it appeared that the people watching me change G's diaper thought it looked so much harder. I usually use the origami fold or the kite fold, but I recently found out about the diaper bag fold, which we tried out for the first time last night. They all seem to work equally well for us, so I just use whichever I'm in the mood for. Washing is still going well also. I'm loving the savings vs. our coin laundry, and I hang dry everything anyway, so this is working out great so far. All in all, at the middle of "challenge week", I'm starting to consider keeping this up after the week is over. The Flats and Handwashing Challenge is becoming more of a physical challenge for me than I ever could have imagined. I was diagnosed a few years back with Degenerative Spine Disease and kneeling over a bathtub has really pushed me to my limits. So we have moved to washing in the kitchen sink! The size of our tiny apartment sink is about the same size as my soaking bucket, but it's relieved so much pain that I don't even care LOL I was able to keep my same wash routine, but I just need to wash smaller batches, so I have been washing whenever I can. I had my brother come over to keep an eye on G while I washed a load this afternoon. Granted there is no place to hang anything outside since I live in an apartment anyway, but it's been so humid and rainy outside that I haven't even been opening the windows. I was concerned about sanitizing the flats, so I had planned on hanging them from the curtain rods so they could get some sun, but instead I've been layering them over my shower rod. Our wipes have been hanging on clothes baskets and our covers our drying on the side of the tub when I have to wash them. So far, only one bad poop diaper, but otherwise, as long as I soak anything with poop, it comes right off in the soak bucket. I will have to say, that at this point, the challenge is very similar to what I anticipated. I actually expected the flats to be harder to wash and that it would take hours for me to wash them enough for them to smell "clean", but it's been going fairly well. Yesterday went fairly well as the first day of the Flats and Handwashing Challenge. So far no real complaints about handwashing anything, other than I had thrown my shoulder out on Sunday, and it's worked it's way down the right side of my back, so leaning over the tub has been the real challenge. I can hardly lift Bug right now, but I'm determined to make this work for the week. So far everything smells clean, but I've noticed staining already. My only other complaint is that I have to stay up later to wash because Bug is going through, what seems like a late colic phase. It actually started right after we started formula, so I'm starting to think they're related, but the Dr won't hear it. Anyway, he's too bucky during the day to wash anything, so once he falls asleep between 10 or 11 pm, I have to wash diapers for an hour (give or take). I get about 5 or 6 hours of sleep then get up, prepare wipes and fold what's dry, and rearrange what's still wet. Also, our first night went fairly well with just flats. I usually use a Thirsties duo hemp prefold, but instead I used the origami fold. And in the folded center, I pad-folded an additional flat inside. I Snappi-ed it under an Econobum cover and it worked great! Day 1: It's Here, It's Here, IT'S HERE!!!! Thanks right mama's and daddy's! Today is the beginning of the flats and handwashing challenge! And what an awesome start we have. Bug woke up 2 hours earlier than usual (lol) so I can get his diapers from yesterday in the wash quick and get him in his first flat for the day. I bleached the bathtub yesterday, and have the bleach, vinegar and baking soda, as well as my Rockin' Green, by the tub for washing and disinfecting (since I'm still paranoid about the staph coming back). I regret not buying a plunger of some kid to help out, but we honestly didn't have the extra money right now. But that's ok! I'm completely psyched! I think my first step with everything is going to be a "wet pail." I don't have a big bucket to wash in, but I did remember this morning that I still have a little 2 gallon bucket that I used for cleaning at our house still packed up. So I played treasure hunt while Bug took a nap this morning and dug it out and have started soaking things in 2 gallons of hot water with a tablespoon of Rockin' Green. I wasn't too concerend with Gabe's first pee-soaked flats, but since I'm using family cloth as well, and don't see the point in only washing those in the washing machine, I'm handwashing my cloth as well. So, step one: soak everything in a wet pail. While I was pregnant I entered a holiday giveaway and much to my surprise, I won! My prize included a bag of Rockin Green laundry soap. I had heard a lot about it already, while researching different forums about different diapers for my soon-to-be cloth diapered baby. I was afraid to use it because I didn't want to waste it (something I look back and laugh at myself for now). Buggie was born and I could not wait to do my first load of cloth diaper laundry! Anyone who knows me, also knows that laundry is a big deal to me. I get a little ocd.. but that's a story for another day LOL I fell in love instantly, and soon we began using it for all of our laundry. For about 4 months now, I've used it for everything, and have not had any problems. J's clothes no longer stink when he comes home off of the road. I wash them and that's it! No more dinginess, and any smells are gone in one wash. And Bug's diapers? My worries and fears of diapers not get clean enough are long gone. Once a month I rock a soak to get out any stains that may have set in and just give them an extra cleaning. We wash every 2 or 3 days, and use our apartments top-loading machine. I do a full wash on cold with no detergent or additives, then a full wash on hot with 2 tablespoons of Rockin Green Hard Rock. I also hang dry all of Bug's diapers. With this routine I've had no troubles with stink, and rarely see a stain. "Rockin’ Green is free of dyes, enzymes, whiteners and brighteners. So you can rest assured that it is safe for all diapers." "Rockin’ Green is made of safe, phosphate free ingredients which makes it good for the planet and gentler on your little ones." "Ingredients: sodium carbonate , sodium percarbonate, natural chelating agents, sodium sulfate, biodegradable surfactants, natural fragrance oils (if scented is chosen)"
"Soft - this formula is designed for those that have sensitive little ones or soft water. Classic - this is the original formula, and is great for those with moderate hard water, or just those that are battling with stinkies. Comes in unscented and scented varieties. Hard - This formula is designed for the most troubling of water types." Rockin' Green has graciously offered to send one lucky winner a bag of 45/90 load soap in thier choice of formula and scent! I'd love to give 2 more of you the opportunity to try it out for yourself, so I purchased a few samples from Abby's Lane! Two additional winners will each get 1 (one) sample of Classic Rock in the scent Motley Clean and 1 (one) sample of Classic Rock in the scent Rage against the Raspberry. Each sample is good for 2 loads in a top-loading machine or 4 loads in a front-loading/HE machine. This giveaway is open to US residents only, and will end on June 19, 2011 at 11:59 pm CST. All entries made after that time will be deleted. Winners with be chosen via random.org and emailed by me. FTC Disclaimer: I won my bag of Rockin Green on my own, and while I was provided with samples after I completed my review, I was not under any obligation to write a positive review or host a giveaway. I was reading one of my favorite blogs this morning, A Year With Mom And Dad, and started reading a post she made labeled"Breastfeeding: I wish I had known...". It immediately struck up those feelings I'm still having about my milk drying up just after he turned 3 months old and having to give Gabe formula. I'm not bashing formula. Now that it's all said and done, I'll admit formula is so much easier for me than the struggles I went through with breastfeeding, but seeing how he reacts to it makes me feel like I'm poisoning my son. But with no concern from any doctors, and no difference from switching formulas, we're stuck like this in the hopes that he just grows out of it. If you start taking the mini-pill (no estrogen birth control) and your Dr tells you it will not affect your milk supply, but you notice a decrease anyway, stop taking it. No mater what they tell you, it can still affect your supply, and if you are determined to breastfeed, there are other birth control options that won't affect anything, like condoms. Your stress is reflected in your supply as well. Shortly after Buggie was born J had to go back over the road and we were being evicted from our house, leaving a lot of that stress of moving and taking care of a newborn and 2 dogs on me. I did it, and J helped me as much as he could, but it got to be a lot, and I ended up having to pump exclusively for a while because the stress was taking a toll on me and Bug alike. Exclusively Pumping is still breastfeeding. Don't let anyone make you feel otherwise. You're working just as hard, sometimes harder to get that milk out for your baby with a machine, kudos to you mama! How much breastfeeding would really bond us. Yes, I'd heard that before, but I never realized how close I would feel to my son until my milk dried up and I had to stop. What do you with you would have known? I was introduced to Modified Momma Creations on FaceBook through a giveaway quite a few months back. Shortly after I started following their blog, Modified Momma Reviews (which is also on FaceBook), I found out they hosted a monthly In-Need giveaway to try and help out families in need by providing one or two families a month with a hand-made diaper that they would otherwise be selling in their shop. I was blessed by these two wonderful mamas, Nikki and Hurley, with a one-size all-in-one diaper for Bug this past March. Nikki also provided us with an opportunity to test her new reversible fitteds at a highly discounted price. Their work is fantastic, and they are awesome to work with. Both Nikki and Hurley also have custom diaper slots available right now, you should check out their work! I will be washing in our bathtub. While this is not ideal for me, especially since we're also battling staph infection right now, we do not own a bucket, or a plunger of any kind, so this is our only option, and I know it will work just fine. I will be using Rockin Green soap, that was not purchased, but won in a giveaway. As we prepare over the next few days, I ask you to check in often for updates. Flats and Handwashing Challenge: Looking for donations! We're preparing for the Flats and Handwashing Challenge here at our house, and I'm looking for further donations in addition to the flats provided by Diaper Junction. Baby G is battling with staph infection, so we're looking for additional flats so I can take more time sanitizing what I have by hand. We are also in need of Snappi's. I have one pair of pins and they are getting very difficult to use with Bug rolling and trying to squirm away from me during changes already. I could also use doublers, but those are not at the top of the list. If you can help us out, please send me a message! Join in the Tuesday Blog Hop! It's Surfin' Saturday! Come follow along! You can check out my review today on their blog! J came home Friday night for the weekend, and it seems like all that night after we got home we all felt a little stuffy. By morning J and I were feeling fine, but Bug now has a bad cold. No fever, but he's very congested, has a hard time sleeping, has a runny nose and a bit of a cough. To make it worse on the poor little guy, we've used up the rest of my frozen milk so he's on just formula now, and his tummy is not liking it at all. He's spitting it up, constipated and super gassy. Hopefully my little man feels better soon!